DENVER--(BUSINESS WIRE)--Visioneering Technologies Inc. (ASX: VTI), a technology-focused company dedicated to improving vision, today announced the availability of NaturalVue® (etafilcon A) Multifocal 1 Day Contact Lenses in Plus Powers. The expansion of plus powers gives NaturalVue Multifocal (NVMF) the most extensive power range available in 0.25 D steps of any daily disposable soft multifocal contact lenses currently on the market1. The product expansion announcement was made at the 2018 American Optometry Association (AOA) meeting in Denver. 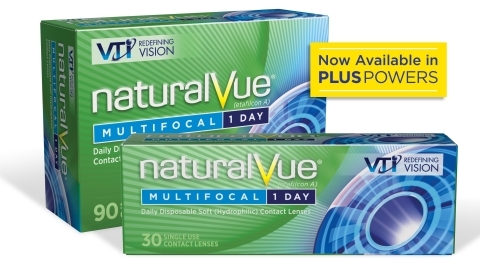 NaturalVue Multifocal 1 Day Contact Lenses were created with technology inspired by advanced camera optics. As a result, the lenses provide spectacle-level vision across all distances2. Through the added plus powers, practitioners will be able to meet the vision needs for a wider range of patients. This expansion will take the full power range of the lens from +4.00 to -12.25 (in 0.25D steps). NVMF plus powers will be available in 30- and 90-revenue packs as well as 10-pack trials. The lenses are available to independent doctors of optometry nationwide. A further parameter expansion to up to +6.00 is planned for the future. Visioneering Technologies, Inc. (VTI), headquartered in Atlanta, Georgia, is an innovative company dedicated to developing products that improve vision. With a portfolio of technologies, the company uses creative and differentiated design approaches to develop products that enhance practitioner and patient experiences. VTI optical designs have been awarded twelve patents worldwide, with an additional seven pending. Strength in science, an entrepreneurial culture, and the ability to bring technology to life make Visioneering Technologies, Inc. a company to watch. For more information, visit www.vtivision.com/ or call 844-884-5367, ext. 104. 1 Tyler’s Quarterly, March 2018. 2 VTI Data on file, 2015. Visioneering Technologies, Inc. announced at AOA the availability of NaturalVue® (etafilcon A) Multifocal 1 Day Contact Lenses in Plus Powers.